Chair one at White Pass lives on despite an adjacent high speed quad. This lift has a strange history; it was shortened in the 1960’s and then lengthened with a turn added in 1983. There aren’t too many 4,800′ platters left out there like it. The platter is practically underneath a brand new Leitner-Poma detachable quad. Spokane was the home of Riblet Tramway Company for more than a hundred years so it’s only fitting that the local ski area has five Riblet doubles in pretty much original form. The oldest is Chair 1 which was built in 1955 but not finished until 1956. Kelly Canyon actually used this Riblet lift as a template to fabricate a homemade version right alongside it when more capacity was needed. Riblet never sold this ski area another lift although it now has a second (genuine) Riblet double which came from Vail. Kelly Canyon’s main lift still spinning after nearly 60 years. This surface lift was one of two original lifts at the Beast of the East which now has 20 lifts. It’s more than 2,200 feet long and still operates despite being sandwiched between a newer triple and quad chair. Garaventa did a bunch of work on the Banff Gondola in 1997 which included new carriages and 40 new CWA X cabins. This is actually the third set of cabins on this gondola. Unlike most of the lifts on this list, the Banff Gondola operates all year long. I would not be surprised to see a completely new gondola built in the next few years at this major destination. North America’s oldest T-Bar is a throwback. Like all of these lifts, #3 T-Bar has some newer components, namely Leitner springbox T’s. 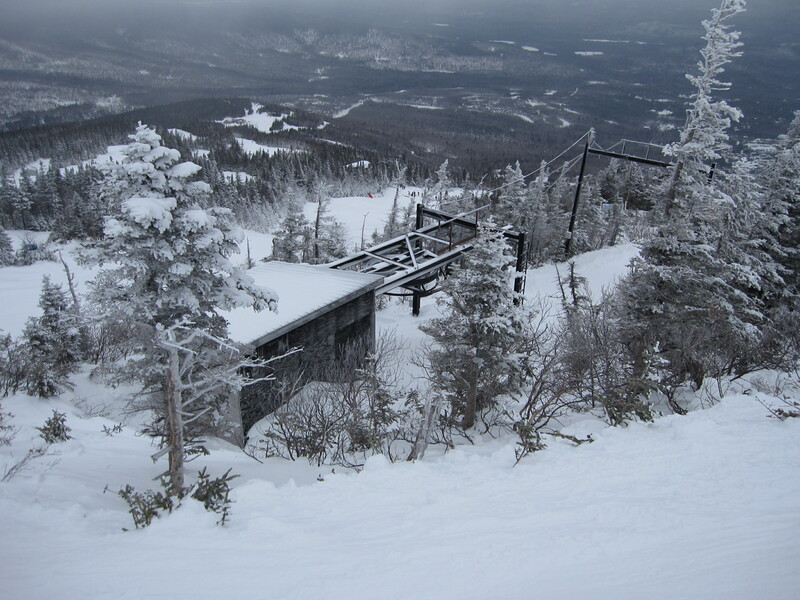 It cost $57,000 to build and sixty years later is sometimes the only lift Sugarloaf can open on windy days. This lift has a newer Riblet overhead drive-tension terminal but the towers and top terminal are original from 1960. In fact, five of ten lifts on this list are Riblet doubles which can clearly stand the test of time. The Riblet lift un Gatlinburg was installed in 1991, its 100% Riblet. Previous, a Heron double was in its spot. I should say the Gatlinburg Sky Lift is a “Riblet”, reenginerred by Superior Tramway, with Superior line equipment. The lift is maintained by Boyne’s MI lift Maintenance crews. This article missed the oldest chair in Canada. It is still operating at Mount Baldy in Thunder Bay, Ontario. The chair was built by ship builders on their days off in 1953, I believe. Interesting. I know their T-Bar was built in 1971 but don’t have a date for the double chair. It looks like a Riblet to me. Having skied / ran races / ski patrolled there, and asked about its history its er… murky. Apparently the 1953 date is accurate, and it was built after ‘careful study’ of other lifts. Its got some very very interesting design features, and is the only chair I genuinely feared for loss of life through exposure . (its as low as -40 operating and VERY exposed). The new owners for last couple of years have at least I understand worked on the operational and safety side. Its for sure still going to be running this season still. Aspen, CO #5 Bell Mountain Riblet Double chair – Installed 1957 and is still in operation. Lake City, CO platter lift was originally installed at A-Basin in the 1940’s at some point, but records are scarce. It was moved to Lake City, shortened and reinstalled. Much of the structural steel has 1944 markings from PA steel mills. I would think that the MRG single still counts as an original lift. The towers are original along with the top terminal. The MRG Single was completely REMOVED in 2007, refurbished, and REINSTALLED as a used lift in 2007. Re: White pass lift. 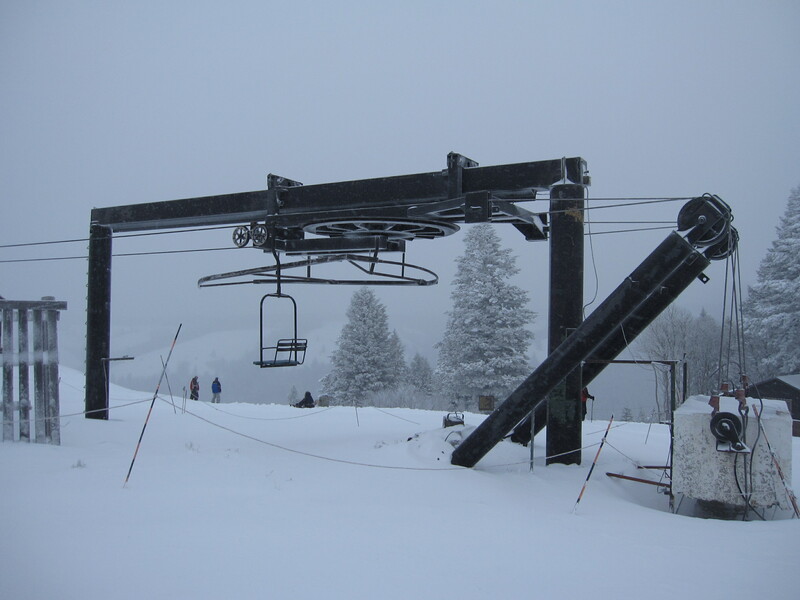 Chair # 1 (pictured) was actually built as chair # 2 around 1962 and installed parallel to the original chair # 1, (1955) which was removed when the adjacent high speed quad was installed. The original lift had only one “erector set” type tower, the rest were “modern” tubular style. Thanks Brian, changing a lift’s name always creates confusion. Makes sense though that White Pass replaced the older of the two lifts with Great White. Chair #2 has always been called chair #2 and was built in 1958. Chair #1 was built in 57 and was removed in 1994 when Great White was built. #2 does not run for public anymore. Saw this old boy running briefly around Christmas. I think they were getting all the snow off it/doing maintenance. 1961 Von Roll VR101 Skyride. Cedar Point Sandusky Ohio. Von Roll VR101 lifts are one of the most solid detachable lifts ever made. Tamarack chair at Kimberley BC came used from either Lake Louise or Banff. It is prehistoric….a double w a center pole and towers with crisis-crossed metal staves. Wish I had a picture. The 1962 Carlevaro-Savio Silver Queen from Crested Butte is still in service as a quad at Timberline, WV. Silver Queen at Timberline WV is entirely Heron Poma. Why is the 1939 AS&W single still operationg at Mt. Eyak not mentioned here? I only included lifts in their original locations. Mt. Waterman has a double installed in 68 or 69 still in operation. You can throw in Greek Peak’s 1963 C&S double. It has Borvig chairs but everything else is pure original, and it operates every single day the mountain is open. Where did it’s SLI chairs come from? No clue. The rumor in our race league at the time was they were shipped out from Utah but I never got a clear answer from anybody. Utah would make some sense as two SLIs were removed from The Canyons in 1997. There is another Miner Denver at Copper Peak in Ironwood, MI. I have parts from both. The Miner-Denver at Copper Peak was built in 1969. I think the Gallery chair (another reliable Riblet double) at Summit Central (Ski Acres), Snoqualmie is a 1962 or 63. I had a newspaper article talking about it once and have seen photos of it from the early 60s. 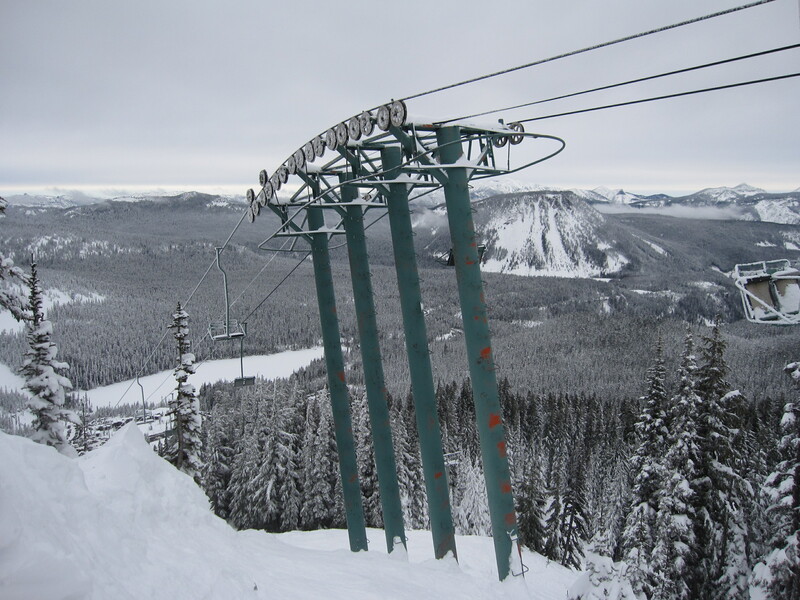 It was the third chairlift built on Snoqualmie Pass. In the 2000s they rarely ran it but after Boyne bought the areas they started to run it almost as frequently as Holiday.